Nutro Wild Frontier Wet Food for Adult Cats is a complete and balanced diet to provide your cat with optimum nutrition and a taste they’ll love. 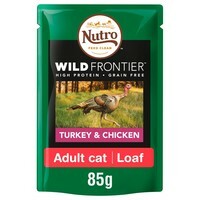 Made with 90% animal ingredients and naturally inspired by diets a cat would eat in the wild, Nutro Wild Frontier is a high protein and grain free food that will provide your cat with all the energy and nutrition they need to play out their own wild instincts. Nutro Wild Frontier Wet Food Pouches are perfect for combining with the Nutro Wild Frontier Dry Foods to give your cat a delicious variety of texture and flavours.